Recently, I came across a project that I thought was interesting, and wanted to learn more about. The project was modding an NES controller to work on the Atari 7800 and 2600 consoles. I quickly thought of a few games that I believed would be great to play with an NES style controller. The first games that came to mind were River Raid, H.E.R.O., and Super Football. All of which were already incredible games, and I definitely wanted to try playing with the modded Nintendo controller. 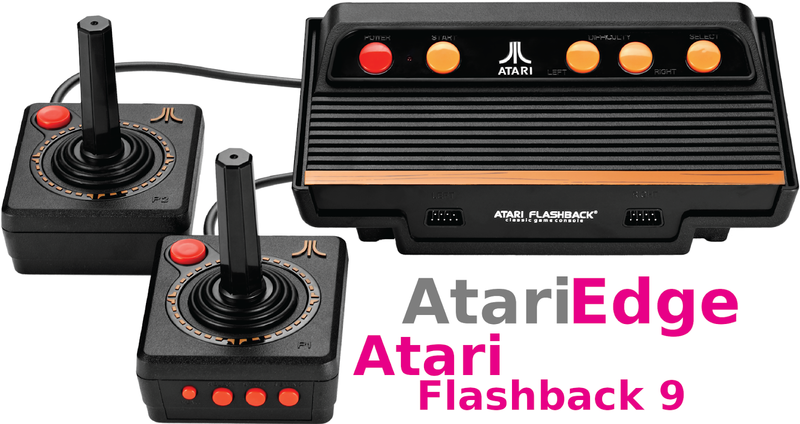 After reaching out to the man behind the project, Michael Tarallo, within just a few short days, he had a modded NES controller delivered to Atari Edge for testing out on the Atari Flashback 8 Gold console for this story. I also found out that there was an incredible story behind the modding of an NES controller to work on the Atari consoles. Retro projects of any kind are always interesting, but when you find out there is a deeper, even more social reason, it always makes a project even better, and Michael's story behind modding the NES controller is no exception. To find out more about this project and other projects that Mike is working on, connect with him on Twitter at @mtarallo and @retrogameboyz. When I received the controller in the mail, I could not wait to plug it into the Atari Flashback 8 Gold console and give it a try. As I expected, the controller worked perfectly as designed, and I quickly began testing the first games on my list. To this day, River Raid remains a great shooter, and unlike many Atari 2600 games, it stands the test of time in play ability. The game, no doubt doubled in ease of play with the NES controller attached, giving it a new, but familiar feel as a top down shooter. H.E.R.O. remains the favorite Atari 2600 game to many gamer's, and for good reason. The game was a true early platform game with more to it than blasting enemies. 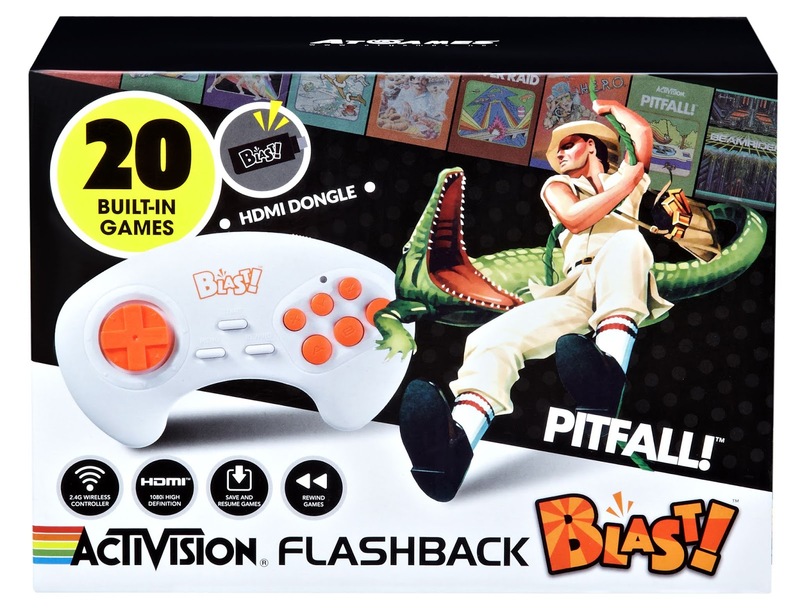 The outstanding game play for it's time is brought to light even more when using a D-pad and buttons rather than the classic Atari joystick. One of my favorite games included on the Atari Flashback 8 Gold, and definitely my favorite sports games on the Atari 2600 is Super Football. Even with the original Atari joystick, this game has with out a doubt remained not only playable, but enjoyable to play since it's release in 1988. Playing it with the modded NES controller makes the game play more reminiscent of other late 80's football games played with a D-pad controller. As I played through other games that I thought would benefit the most from the use of the modded NES controller, I soon found that the list was increasing quickly. As I played through games like Crystal Castles, Enduro, Frogger, Pitfall, Frostbite, Megamania, Millipede, Dodge Em, and countless others, it became apparent how much easier, and more enjoyable many classic Atari 2600 games are to play with a D-pad controller. Two games that I did not have on my original mental list of games to try, but have stood out in how much better they are to play with the modded NES controller are Enduro and Keystone Kapers. After thoroughly testing the modded NES controller, the D-pad and button controls are accurate, and provide smooth gameplay. 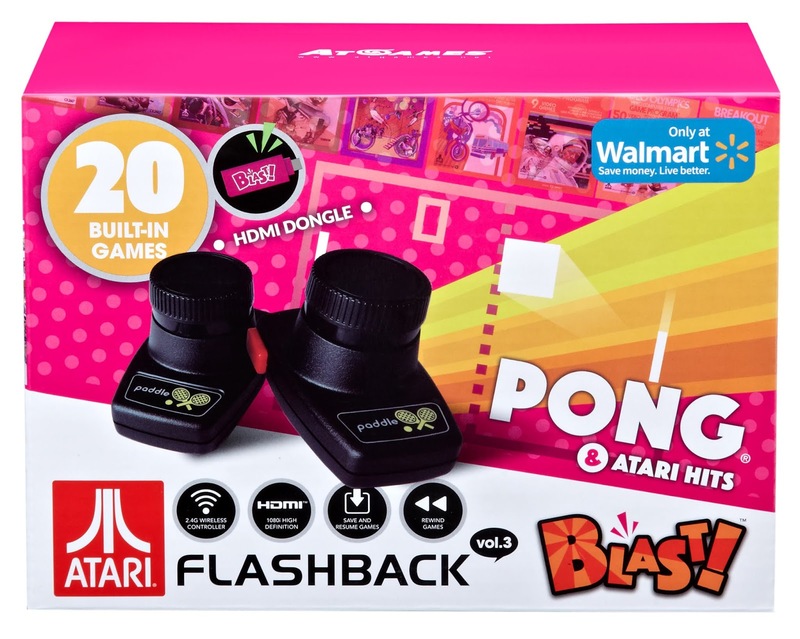 The only reason to need the original Atari Flashback 8 Gold joystick is for the additional reset, select, start, and replay buttons on the front of the joystick. This was not an extremely inconvenience, as I just left the joystick sit beside me while playing, or used the buttons on the top of the console, as gamer's have done for many years prior to being spoiled to the point that we now never have to leave the couch while playing. One of the most interesting aspects of Michael's modded NES controller is the story behind it. For this part of our article, we thought it would be best to hear it from him, so we decided to work together with him to bring you the story behind the story. "One day I broke out a few of my old video game consoles to show my Dad what I have been collecting. We had just finished reminiscing about the days when we had the Atari 2600 and I thought it would be fun to show him what other consoles I had in my collection. I went up to my office and brought down a Colecovision and a Atari 7800. Both were consoles I never owned growing up. (Hell, only the rich kids had the Colecovision.) However, when attempting to play some games, my Dad was unable to hold the controllers properly due to pain from the severity of his rheumatoid arthritis. A chronic disease that causes joint pain, stiffness, swelling, disfigurement and decreased movement. He has suffered with this for many years. Yet, he has been able to adapt and still attempts to do what he can. However, that night he was unable to play with my son and I. He simply was unable to work or grip the controllers comfortably because of those awkward controller designs. Seriously, even when I attempted to use them, my thumbs ached a bit and I don’t have arthritis,….yet. Previously, I was working on an a project where my son and I used an old Atari joystick to control some servos with an Arduino micro-controller. I recall the Joystick circuitry being fairly straightforward and wondered if it was similar to the NES controller. This project inspired me to cut the Atari DB9 cable from the joystick and “crack open” the NES controller and start inspecting. Having a small electronics background with some basic knowledge of PCBs, capacitors, resistors, diodes, transistors etc. 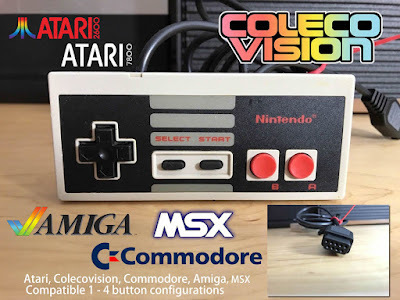 – oh not to mention a steady hand, mad soldering skills and keen eyesight – I was able to figure out an approach that would transform a standard NES controller into a functioning Atari 7800 controller. I was so excited about my success I captured the moment on video to share with others, and the next time my Dad came to visit, he was actually able to play some classic games on the original consoles with my son and I." 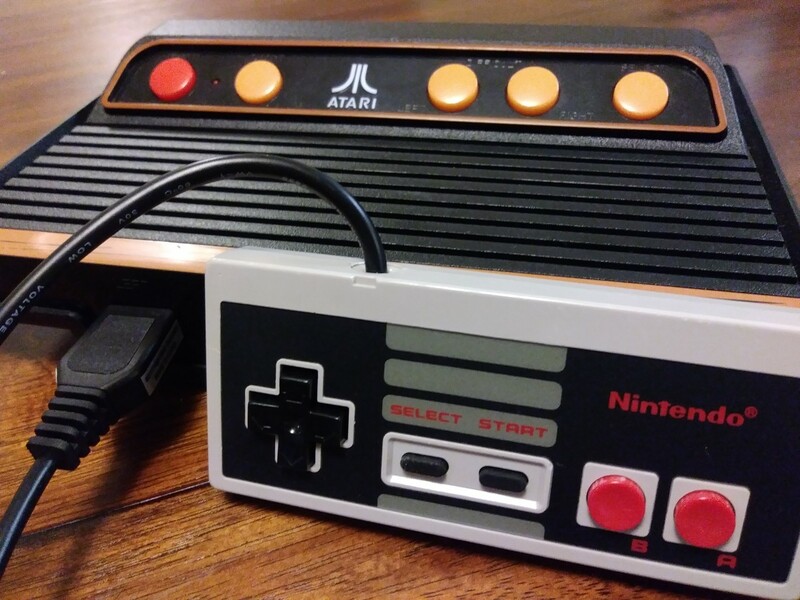 We at Atari Edge want to thank Michael Tarallo for not only sending us a controller to test on the Atari Flashback 8 Gold console for this article, but also for taking the time to share the true story behind his modded NES controller. If you would like to see what other NES controller mods he has, or to purchase your own modded NES controller, Click Here.